Although the year 1929 brought Nick his biggest selling record it also brought the Great Depression which eventually killed Vaudeville and nearly did the same for the record industry. Nick's records, however, continued to be good sellers through 1931, when he left Brunswick over a dispute but he returned to them in 1932 after making a couple of recordings for the Hit Of The Week Label. After returning to Brunswick in 1932, Nick made several more excellent recordings before his days at Brunswick were over. 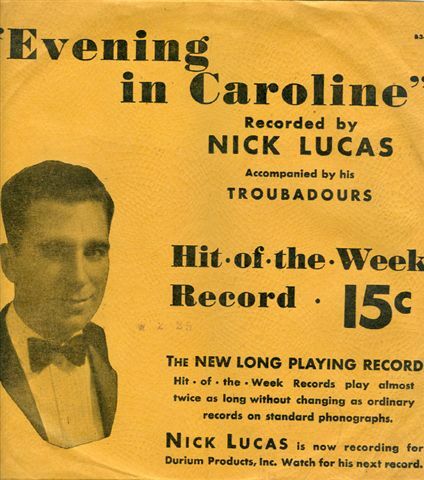 In 1933 he formed a band called Nick Lucas and his Troubadours, which he lead for a year. After leaving Brunswick he recorded for several minor labels as well as various transcription companies.